I will be starting with a easy recipes, so that you will be getting into cooking with simple foods & gradually proceed towards harder ones. 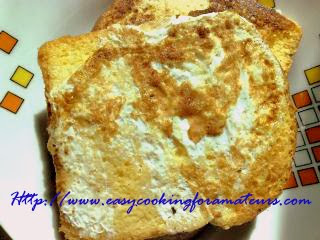 Bread-Omelet /French Toast is a very easy,delicious food . Helpful for working people who is in hurry to their work and don't have enough time to prepare breakfast . Bread-Omelet can also be taken as evening snacks. Those who are diet and health conscious they can use brown or multigrain bread. Though there will be slight different taste between white bread & brown/multigrain bread. Sweet bread-omelet is one of my favorite But my hubby likes spicy & sweet bread-omelet. So I am going to show both of them. Add eggs to it & beat well. Dip the bread in to the mixture, make sure it is coated on both sides. Note: Don't soak bread for too long just dip both sides & remove immediately. Put bread on a griddle plate/tava in medium flame. Drizzle oil on sides and above the bread. Now Spicy & Sweet Bread-Omelet /French toast is ready to serve. In a mixing bowl add eggs and sugar, beat well. Follow the same procedure of spicy & sweet Bread-Omelet /French toast . That's it, isn't it easy?